Showing results for tags 'performa'. Feeling like an idiot....when I undid the clips to get this thing apart, a little clear piece of tubing came unstuck from under the top. I can't feel a clip that might hold it or otherwise figure out where it goes, But with it still loose, the washer fill won't shut off. Is this the line to a pressure sensor/switch for the fill switch? Have I missed something else? 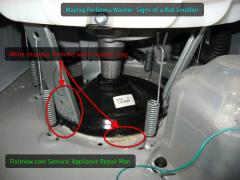 Maytag Performa and Atlantis Washer Transmission Diagnosis Text file with troubleshooting tips.